Hi Everyone! This is a mini album/card I created as a kit for my club. It can be a card if you don't want to add a picture. It's not an accordion style album but depending on the closure, it can be an accordion style. With this particular album, it opens like a regular flip page. 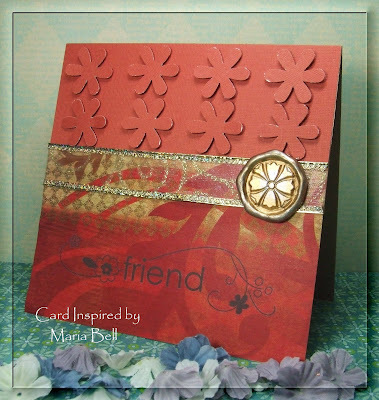 I created a similar album/card on Stampin Inspirations with a "clip closure" rather than "ribbon closure" and that album opens accordion style. You can check it out by clicking here. 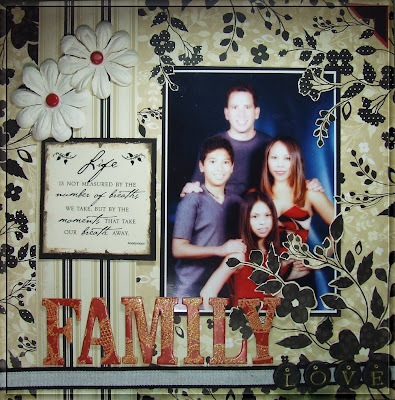 I used CTMH Life Delights Level 2 Paper Kit which is really pretty paper kit. 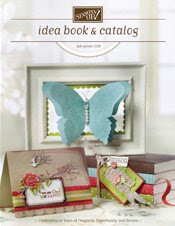 If you are interested in this paper kit, stop by my CTMH website located to the right side bar of my blog. I used a Sizzix flower die to create the flowers. It's just a fun album that you can treat like a card and send to a loved one. Here is the album opened up. It's just pictures of me and my husband. I think I'm going to give it to him for Father's Day although the design is more feminine. He doesn't care about the design anyway. He likes receiving my card creations but unfortunately, I don't give them to him often enough. Hope everyone have a wonderful day!! Good Evening, Everyone!! When creating a card, do you usually have a plan before you start? Many times, for me, it's pretty random. 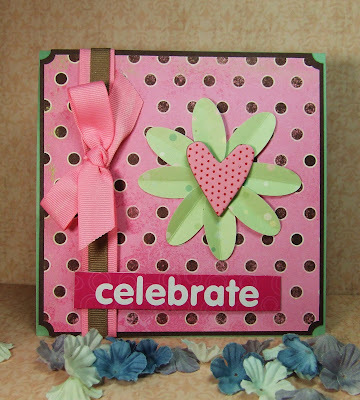 For example. . .I created the theme of this card because as I was walking towards my craft table, I noticed that the "L" chipboard was on the floor. 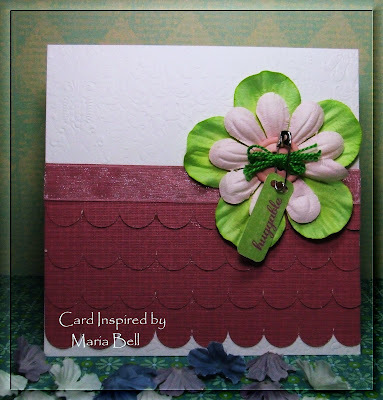 Rather than putting it away. . .I decided to create a card with that chipboard. That's how I made the decision to make this card. Anyway, nothing much to the card. I basically tied a ribbon around the chipboard, added a metal tag, placed a sentiment sticker on to the designer paper and tied a ribbon around it. Simple. Sheesh, I stayed up late,late, late last night. I went to bed about 3 in the morning. Was I crafting? Nope. . .I was watching music videos for several hours on YouTube. Isn't that terrible? But. . .I did have fun. I love finding live concert videos of my favorite artists. I watched a bunch of concert videos of "No Doubt". I really love Gwen Stefani when she was with her band. She was a unique rocker chick back then. . .but I don't know what happened. She's now more into hip-hop. Nothing against hip-hop music because I listen to all types of music but I loved her best when she was in a rock band. Anyway. . .maybe I can squeeze in time to create a few cards tonight or maybe not. Weekends are usually my "family" time and if I can squeeze in "crafting" time I try to but it's not a priority on the weekends. Hope y'all are enjoying your weekend!! Happy Friday, Everyone!! 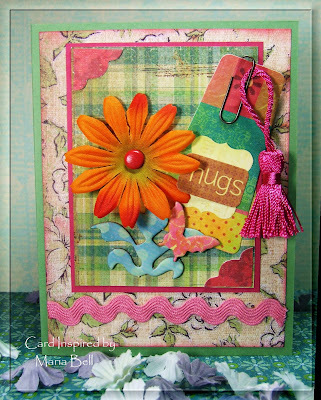 I think I'm going to designate Friday as my "scrappy card" day meaning. . .creating cards using scrap pieces from my scrap pile. With this card, I'm just using up a few Primas that I've had, like. . .forever! I mean seriously . ..forever. I think I bought these little Primas about 2 years ago. LOL! The lace was given to me as a RAK. My only problem with "scrappy" cards as opposed to "rubber stamped" cards are scrappy materials are more expensive, therefore, the cost to create scrappy cards cost more regardless of how simple the card is. Creating a card with rubber stamps are cheaper to some degree because if you don't put any embellishments on your card, then the only associated cost is the cardstock and "ink". Anyway, with this first card, I used the SU Love & Happiness rub on for the sentiment. 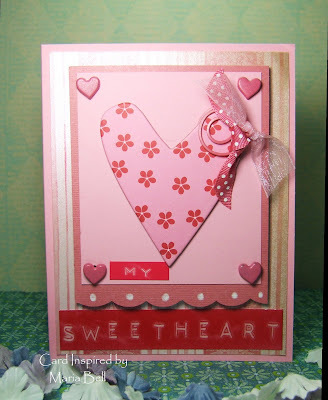 The designer paper is by K&Co and the cardstock is by SU (Pretty in Pink). This is just a random card I made using scrap pieces and papers. The only non-scrap item is the ribbon and the base card. Trying to reduce my scrap pile is a daunting task that I don't think I'll ever reduce it completely but I continue to try anyway. The big flower on my card came from a container of large prima flowers that I bought from Target almost a year ago. I only have a few left in the container so I'm really happy that I'm slowly using it up. There's a part of me that don't want to use them all up because whenever I went to Target, I noticed that they haven't restocked this large prima flowers for over 6 months now. I know I won't be able to find this particular primas again so I have mixed feelings about using them up but it's silly to hoard them. . .KWIM? Anyway, back to making more scrappy cards!! I'll see if I can make more of them tonight. Good Afternoon! Well, this will be my last card using punches. You must be tired of it already but I had such fun coming up with different layouts using the different punches. I posted a few more on Stampin Inpsirations using stars and squares if you care to check it out! With this card, I used the SU slit punch and punched a scallop in a row. I then layered a few over one another to give it a sort of a ruffled look. Good Afternoon! 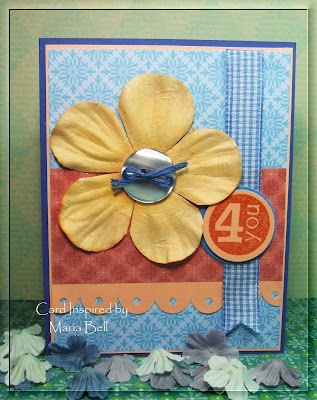 Here's a card I made using a daisy punch! Like my other card yesterday, I punched the flowers (yesterday's card were circle punches) using a SU daisy punch and mounted them with foam tape. 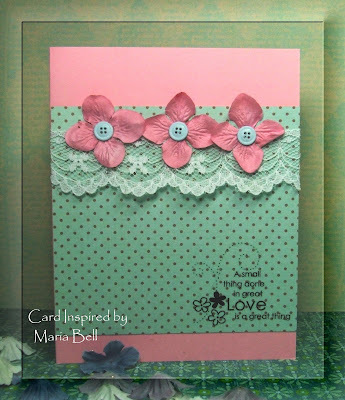 I, again, used textured cardstock to add a little character to the punched flowers. In person, you can see the texture better. The card is a very simple design. Nothing much else to the card. The sentiment is a rub-on by Stampin Up. This is the card at a side angle. As you can see the flowers are 3D looking. Hi Everyone!! Good afternoon to y'all! This is a hanging flower frame that I created my stamp and scrapbooking club as a kit that I sent to the members. 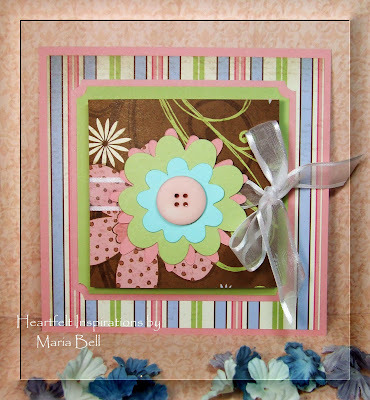 It's a simple scrappy project using a flower template located here. It's really quite simple to create. All you need to do is print the template, resize the template to your desired size, trace it on your cardstock and designer paper and cut the flowers out. 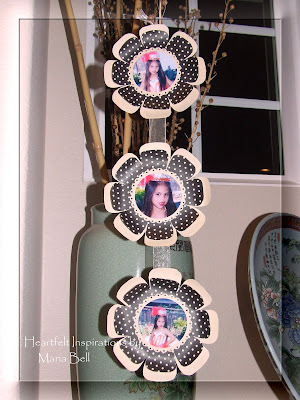 You then add your picture and place the flowers on a round chipboard coaster. Before placing the flower, be sure to add a long ribbon running down vertically. Glue the flowers in place, punch a small hole on the topmost coaster and tie a ribbon for hanging. That's it. This is a close up of the flower frame. I don't know if you recall but I had created these flower frames in the past but I did not create a "hanging" one. This version, the frames are smaller. The past version was larger and I had mounted the frame on a large round plant cork board to create a "plaque" instead a hanging frame. Anyway, this is a picture of my daughter when she was a little girl. She was in a ballet for several years and this was one of her costumes for a show that they did. I absolutely love the costumes that they wore. I used the Close to My Heart "Silhouette Level 2 Paper Packet" for this project. It's such a pretty paper kit. You can find it on website and you can purchase it online as well . . .visit my Close to My heart website . . .the link is located on my right sidebar. Just a few more cards that I made today. I'm on the roll! It's liberating to use all these scrap stickers and chipboards that I have. I sometimes think I'll never, ever get it reduced. I don't create scrapbook layouts as often as I should. . .maybe if I did, I probably would do a better job at reducing my scrap pile. I think that's the next step I need to make. . .you know, create scrapbook layouts and use all the left over stickers. I like how this card turned out. It's simple but still happy looking. The scrapbook paper actually is a paper by DCWV that came from a Christmas pack. Hey, let's all make it a goal to clean up our scraps, stickers, and such so we can start fresh!! Are you with me on this??? Here's another card I made using the layout below. 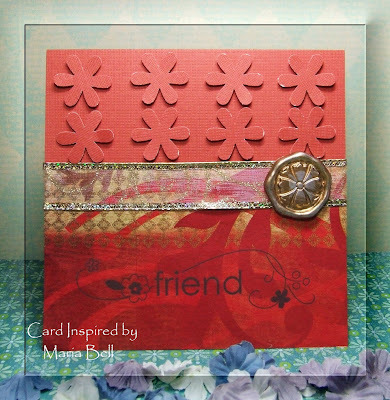 Again, using scrap pieces. . .I used the metal tag from making memories and layered it with a chipboard flower. 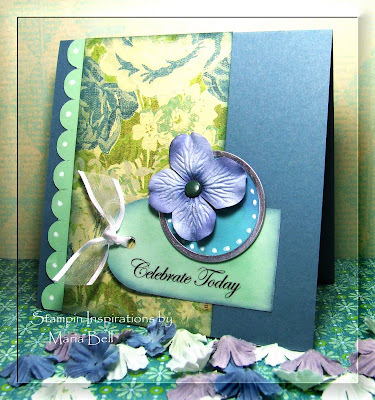 On my previous card using this layout, I used a prima flower. Can you see the stitches? Well, it's a faux stitch using a rubber stamp by CTMH called "Simple Stitches. Initially I was going to use my sewing machine but I was too lazy to look for a thread to match my card. Hi Everyone! I finally had time to make a card! Yay! This was quite fun to make and again using scraps. You're like. . .wow, you have a lot of scraps Maria! You bet I do. . .I have so many opened packs that it's not funny. I rarely make duplicate cards so what ends up happening is whenever I create a card, I don't use the same materials but end up with a lot of opened packs. Terrible. I think I'm going to start making cards with the same design so I can use up all the extra stuff I have. 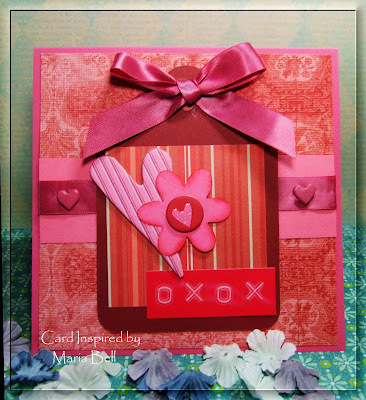 I may use a different paper or colors but the create the card using the same material. What do you think? Do you make duplicate cards or are you like me who create a different card all the time? 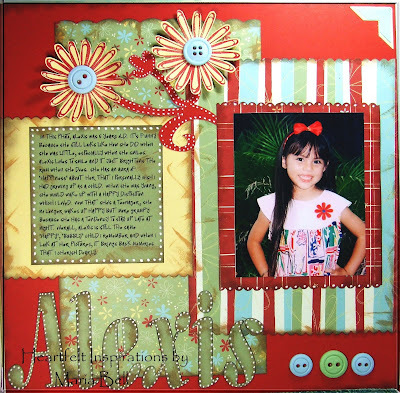 This layout was inspired again by Scrapbook Trend magazine/book. It's similar but a little different. I didn't really like the book sample but I took parts of the design and created a similar design with my own personal touch. Good Morning and Happy Saturday! 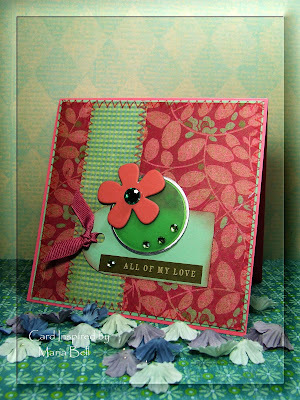 This card was inspired by a layout I saw in a magazine called Scrapbook Trend. I've been looking for different ways to use my ribbon and I saw this layout in the magazine. I buy magazines all the time but rarely ever use any of the ideas that I see in these magazines. Are you that way too? What's the point of buying the magazines if you never learn from the samples? So not to waste my money, I decided to start "grabbing" ideas from magazines and incorporate them into my scrappy cards. 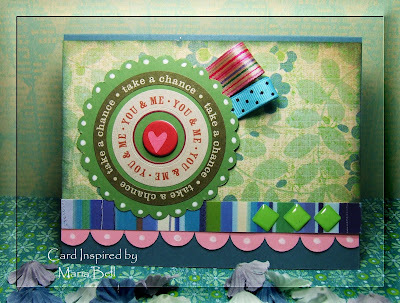 I'm sort of layout challenged when it comes to scrappy cards because many times, the materials I have don't quite match in color or design and that's where my problem lies. 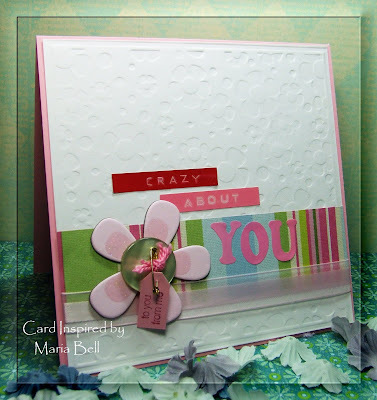 With rubber stamping. . .a lot of the cardstock match with the ink color, you choose the sentiment, the image and there's almost a controlled layout when creating rubber stamped cards. 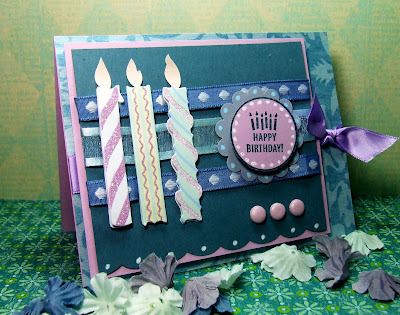 On the otherhand, with scrappy cards, well, you have to use the stickers and embellishments that you have and sometimes they don't always match in design or color. I'm learning to be less inhibited. I'm sort of getting over the fact that the papers, embellishments, and cardstocks don't always have to match. 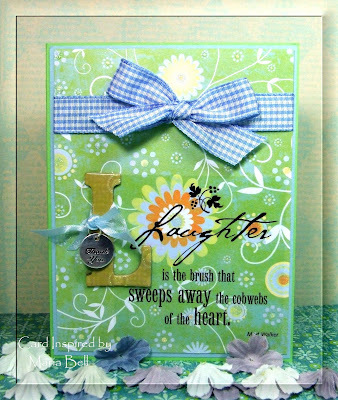 Making scrappy cards is a great way to reduce your scrap pile. 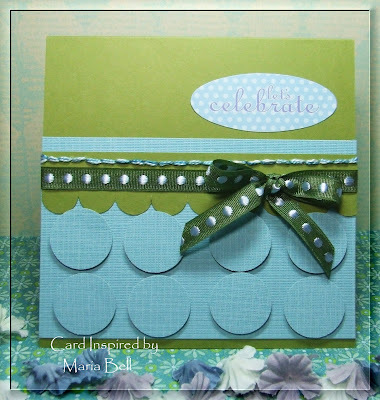 Except for the sentiment and the base cardstock, the materials used for my card were from my scrap pile. Trust me, my scrap pile is HUGE - 3 years worth, as a matter of fact. LOL!! Hi Everyone! Sheesh, I haven't posted anything on this blog site for a while now. Sorry about that but I had a bit of medical problem for the past two weeks and what time I did have to craft, I concentrated on my "Stamp and Scrapbooking Club". I had to prioritize my time. I'm feeling better now so I think I'll be back to my normal crafting and blogging. 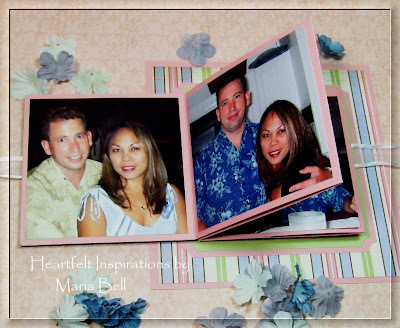 This scrapbook layout is a layout for a challenge on my club's blog site "Heartfelt Inspirations". Every 2 weeks, I post a challenge and give a prize to a winner. I also have a weekly card challenge for my club members. I am enrolling new members for April to June membership. Email me at lbmcd66@hotmail.com if you are interested in the details of my club. I'll continue to take new members until April 15.